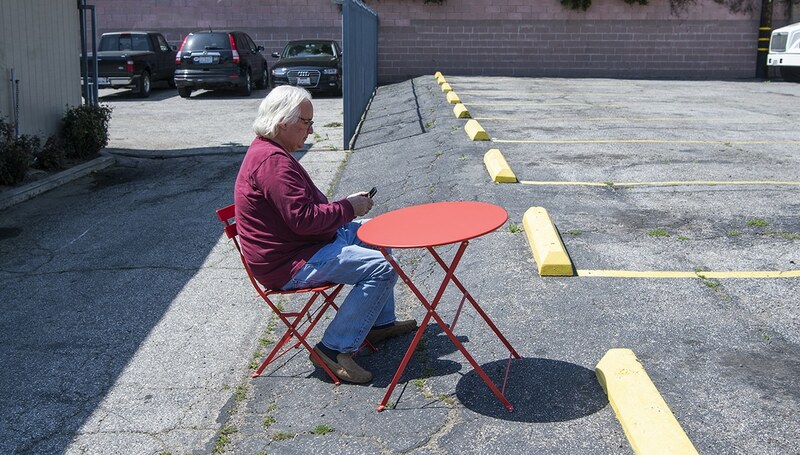 Long Beach Post Columnist Tim Grobaty sits on 4 feet wide slightly sloped land that is for sale between two parking lots on the 3800 block of Long Beach Blvd. in Long Beach Saturday, March 25, 2019. Photo by Thomas R Cordova. Pieces of land are at a premium in the Long Beach area, and by “piece of land,” I mean land unsullied by mankind’s never sated appetite for building upon it. Not a house, not an office building or hotel, just sweet, sweet land; a blank slate with a potential limited solely by your imagination. I’ve scoured the various real estate and investment companies looking for a nice slice of vacant property available in Long Beach. Not something wildly over the top like the city’s elephant lot, which is waiting patiently for someone to drop a baseball stadium on it. Or the $4 million piece of grassland in Naples that I’ve mentioned in an earlier column. “Want to build higher?” (Yes! God, Yes!) “How’s 500 feet?” And I was just about all in, till I got to the price tag of $5.25 million, which didn’t leave me a lot of extra money to take her to 500 feet and damn the cost. Want to go high? This skyscraper-zoned plot in the East Village is listed for $5.25 million. Courtesy photo. I finally found some land that wouldn’t explode my pocketbook. A piece of Bixby Knolls/Los Cerritos on Long Beach Boulevard for $17,995. OK, before you get all excited, I need to tell you you’re not going to go up to 500 feet on this plot. In fact, “plot” is too magnificent a term for what $17,995 will buy you in Bixby Knolls/Los Cerritos. I will tell you that I can fit in it, unless I tip over in a north-south direction, which would put at least part of me in someone else’s property. Trespassing by falling. The land for sale (and it’s been for sale for about 500 days) is impressively long at 96 feet, and depressingly wide at about 4 feet. It runs along a parking lot to its north side and a driveway for some vacant law offices to the south. It also slopes steeply for about 65 feet of its length, making it useless for a bowling alley or shuffleboard court. It’s unclear how this .01-acre hunk of Long Beach didn’t fall into the hands of either of its neighbors. 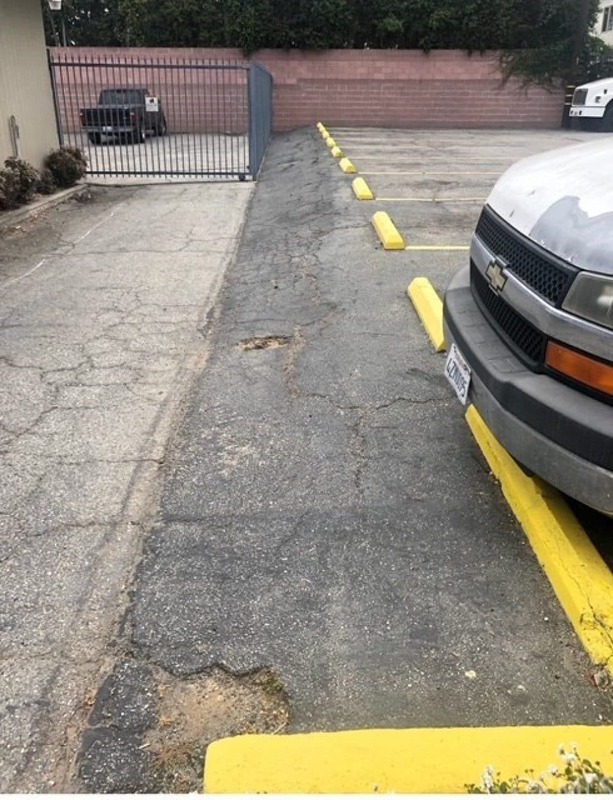 The strip of land that’s for sale in Bixby Knolls is the dark area between the yellow parking blocks and the adjacent lighter-colored driveway. Courtesy photo. I set up a nice little bistro table on the land to see how I liked it and, to be startlingly honest, I’ve stayed in nicer places, though at least it’s across the street from Steelcraft, so lunch is taken care of. The listing agent, Tova Oren of ERA North Orange County, said her client is “adamant” about the price and is in no huge hurry to sell it. The consensus, though, is that nothing permanent can be put up there, which destroyed my dreams of building the world’s skinniest office on it to shirttail on the fame that accrues annually to the Skinny House at 708 Gladys Ave. in Rose Park. After some serious soul searching, I came to the conclusion that the piece of land and I aren’t a good fit for one another. When I tip over, I don’t want to care about which way to fall.